Early the next morning we all hiked up the Apple River again, reaching our view point just after 6:00 am. We�re ready to stay there for the morning with great optimism since there would be no helicopters flying today. As the morning went past, our optimism faded and by 8:00 am we decided to move down the river. We were a few yards back down the road when Michael and Russ spotted a grizzly walking out to the open grass area, but it did not look like the one we saw yesterday! �This one has no ears�, �I can't see his ears either� was all that we hear from both guides. �Lets go�! We went back to the same stalk as the day before - across the river and numerous mud channels. 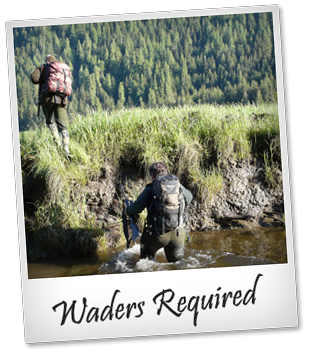 Now we understood why Peter had recommended hiking boots and not waders, since more than once we sunk in mud up to our thighs. We walked up the river to where it was shallow enough to cross and then walked down the river on the other side. It took us almost twenty minutes stalking to get a good view of the spot where we had last seen the grizzly. When we glassed, we saw nothing, once again nothing! Alvaro and I couldn't understand what had happened! While we looked at each other totally puzzled, Michael and Russ were glassing around since they were sure the bear could have not gone far. After 10 minutes, although it seemed like a lifetime to me, I saw the bear walking out of a deep ditch a few hundred yards from us. He was walking in the same direction as before. We slowly stalked closer, at 90 yards he walks out into the open. I get three shots at him, he dropped on the first one and again on the third, but probably missed the second shot. �He�s down!� Russ says as he falls �he�s big�. Once we get close we can really see his size! Huge hump, white claws, large paws with oversize and badly worn pads. He�s a really old warrior! His hide is full of scars and old wounds and he has no teeth left in his upper jaw, his canines are totally worn out with exposed roots and his lower jaw is extended beyond the upper one. I believe he wouldn�t have made another winter. As we get ready for the photos, Michael mentions that he thinks he is bigger than the one they took last year which scored 24 12/16�. 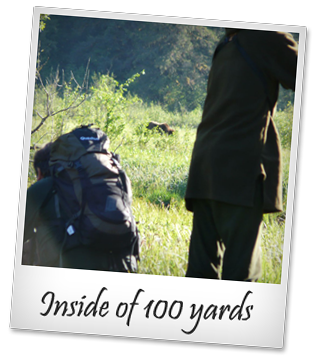 We start taking photos and approximate measurements which bring us to realize how huge an animal he is. 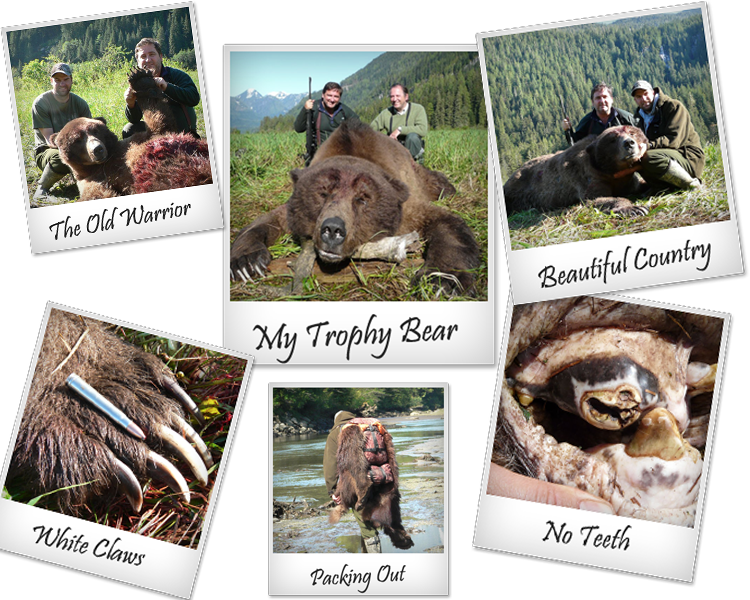 Once we have taken the photos and start moving the bear for skinning we realize that his weight is probably 350 kg (750 Lbs) or more. The skull needs to be removed to lighten our load for packing the hide out! It is long and wide and we become very anxious to get back to the boat and do a proper measurement. While taking photos, I look around and admire the wonderful scenery. The valley estuary is a mile wide, two miles long, with cedar forests on each side rising to five thousand foot snow covered mountains. The bright green valley grasslands against the cloudless blue sky with bright sunshine .It�s amazing how your mood changes once again with harvest of such an impressive trophy animal. Back at the Estero, Peter can not believe our initial estimations until we unpack and he gets his tape out. We then take measurements of the hide which squares 8� 7� and the skull is scored by Russ at 26 1/16� for GOABC using the upper jaw for length. The �green score for SCI� using the bottom jaw is 26 14/16. It takes me a few minutes to realize what those measurements really mean, and just a few seconds for Peter to bring out the champagne bottle to toast this trophy animal and the hunters and guides for their success. For the rest of the day we just sit, relax, while the guides prepare the hides and skull for shipment and talk about the hunt for the afternoon.